If you've never enjoyed the sticky goodness of a campfire marshmallow and melted piece of chocolate sandwiched between two graham crackers, you've missed out on the most delicious part of camping there is. 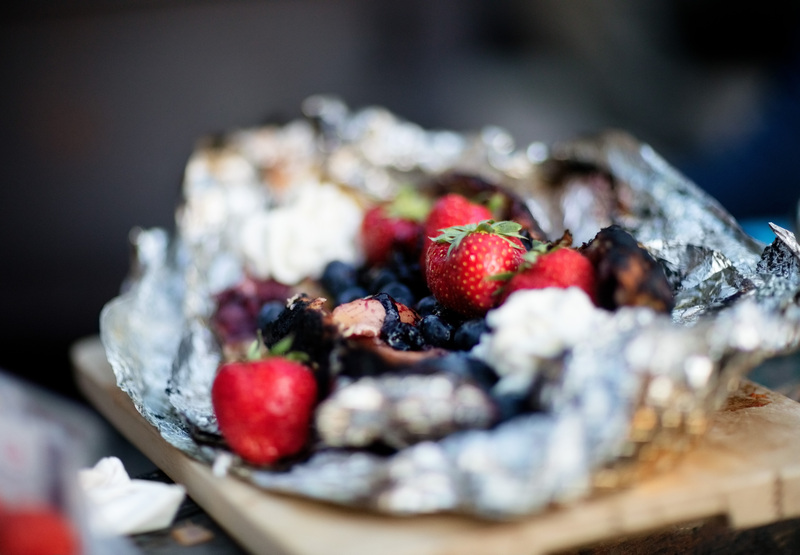 And while the classic s'more will also reign as the most iconic hiking treat, the delicious desserts you can enjoy at the end of a long day don't have to stop there. There are a number of sweet and delectable recipes you can create with camping cookware and a fire pit. When it comes to enjoying scrumptious treats in the backcountry, just be sure to plan ahead as a few recipes require ingredient preparation before you hit the trails. Oreo cookies make for a great trail treat. They're easy to transport and they're great when dipped in peanut butter. But with just two more ingredients you can make an entire cheesecake that your hiking crew will devour in moments. With the recipe from Backpacker, you'll be the hit of the camping trip. At home, place all Oreo cookies in a plastic sealable bag. Add about half of the crumb mixture from the cheesecake box mix. You'll want to keep some of the crumbs for the topping. Pound the cookies into crumbs. Bring the rest of the cake mix in another plastic bag. At camp, slowly add oil to the crushed cookies and crumbs to form a thick putty that you can mold. To make the crust, press the mixture along the sides and edges of a serving bowl. To the cheesecake bag mix, add water and knead until it reaches a custard-like consistency. Transfer the filling to the bowl. Let set for about 10 minutes. You can set a timer using your PRW3100Y-1 Pro Trek watch. When time is up, top with remaining crumbs. Before leaving home, combine the vanilla custard powder, milk powder and sugar in a plastic bag that seals. Pack all other ingredients separately. Boil 1/4 cup of water of the fire. Once boiled, combine with instant coffee and set aside to cool. Add the pre-mixed vanilla custard ingredients to the pot and slowly add 3/4 cups cool water. Bring to a boil over medium heat while stirring continuously. Reduce heat and let custard thicken on simmer. Then remove from heat and let custard cool. Add Amaretto liquor. In a mug, combine half of the crushed biscuits and half of the cup of coffee. Spread half of the vanilla custard over the biscuits. Repeat layers and dust with cocoa powder on top to serve. This homemade dessert will bring you back to the memories of the Thanksgiving table and your grandmother's famous blueberry pie. From the cookbook Foraged Flavor by Tama Matsuoka Wong and Eddy Leroux, this wild blueberry crumble will make your mouth water, according to Outside Online. If you're able to bring a Dutch oven on the trails, that is how this crumble is traditionally made. However, you can substitute with an entirely metal backpacking pot that has a lid if easier. This recipe is best when incorporating a variety of berries found along the way. Before leaving the house, combine the dry ingredients in a plastic bag that seals - this is your "crumble". In two other bags, pack the butter and lemon. Once you set up camp and are ready to make dessert, combine crumble ingredients with butter in a single plastic bag. Add jam and berries to the Dutch oven. Then add flour and juice of 1/2 lemon. Sprinkle the crumble ingredients over the berry mixture. Place over campfire with lid on. Add coals on top of the lid for even baking. Cook for 35 minutes, until berries begin to bubble. Let cool before eating. Another recipe that only requires a few ingredients, these chocolate muffins are a great dessert but also serve as breakfast too. If you want to spice up this recipe from Trail Recipes you can add your choice of nuts or berries. Ensure the olive oil is in a spill-proof bottle or container before hitting the trails and put the muffin mix in a sealable plastic bag. Once you get to camp, add 2 tablespoons of both water and olive oil to the muffin mix bag. Knead well to mix ingredients. It should be as smooth as possible. Use a camping oven pan to hold the muffin cups. Carefully fill each one with muffin mix batter by cutting off a corner of the bag and squeezing. In a Dutch or Outback oven, place the pan and let muffins cook for 12 minutes. Then turn off heat and let muffins sit for another five minutes. Ensure they are cool before eating. Enjoy these tasty treats on your next hike.